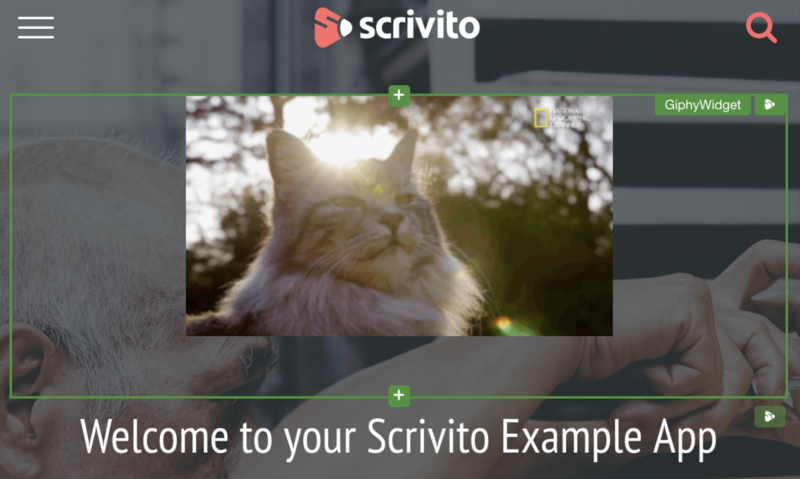 In this tutorial we're going to show you how to embed Giphy GIFs on web pages with Scrivito. It guides you through building a Giphy Widget from scratch and using a third-party service. This tutorial requires some basic knowledge of the Scrivito workflow and React. It is based on the Scrivito Example App but can be used to extend any Scrivito app. We'll implement a “GiphyWidget” so that editors can place random GIFs on any page simply by selecting the widget from the widget browser. Additionally, we will limit the randomness by providing a tag option. For finding GIFs, we'll use the giphy-js-sdk-core package. So let's include this component in the Scrivito app first. First things first, so let's add the file for the new widget model class in the project at “src/Widgets/GiphyWidget/” named “GiphyWidgetClass.js”. In this file, we make the widget model known to Scrivito by calling Scrivito.provideWidgetClass and passing the widget class name, “GiphyWidget”, to it. Next to this name, we pass an attributes definition to it consisting of just a single attribute, tag, that lets us restrict our image request later on. For rendering instances of the “GiphyWidget”, we’ll now create a React component (and make it known to Scrivito). We suggest using an ES6 class to define such components (extends React.Component). Inside the render function, we can access the widget instance via the corresponding widget prop to fetch the widget attribute values. As you can see, we are importing the Giphy SDK and using it for requesting an image and saving its URL to the component’s gif state prop when the component is mounted. This causes a new GIF to be requested each time the widget is inserted into the DOM. The render function outputs the Giphy image referenced in this gif state prop. Finally, to have Scrivito use the “GiphyWidgetComponent” for rendering instances of the “GiphyWidget”, we associate the widget class with the component using Scrivito.provideComponent. Click the + icon at the top or bottom edge of a widget and select the “Giphy” widget from the widget browser. You will see a random GIF generated. If you would like to limit the randomness to a specific tag value, you can specify it in the widget properties. Get your own API key The public API key should only be used for testing and may cease to work at anytime. Use an AWS Lambda to fetch the image URL if you want to hide the API key from curious eyes. and a UI specification for making at least those attributes editable (Scrivito.provideEditingConfig) that cannot be accessed directly on the page.